The Foundry Print and Embroidery Shop provides custom embroidery services in the greater Seattle area. We’re dedicated to helping businesses, retailers, non-profits, teams, and even bands produce creative, high-quality embroidered garments. Our knowledgeable personalized embroidery staff cares about every single project our Seattle facility receives. No matter what we embroider, we want to ensure that the highest quality is there, whether we’re creating apparel or promotional products. Why are we the best when it comes to Seattle embroidery services? Our staff truly values our customers. We want to develop a relationship with you and make sure our work exceeds your expectations. Furthermore, we go out of our way to find the right materials and use state-of-the-art equipment for your project. By providing quality products, committing to our customers wholeheartedly, and holding ourselves accountable, we can create the best customized apparel for your business or team. Digitizing— Digitizing is the process of converting any image or design into an embroidered product. 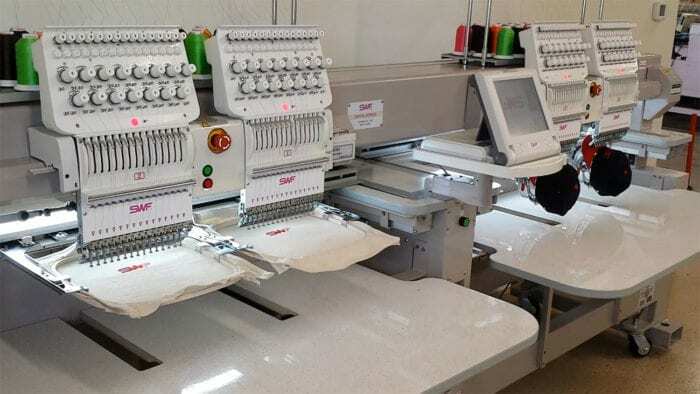 It’s essentially a roadmap for the machine to sew out; we prepare your art for embroidery through our digitizing software, which utilizes thread color match. Then, we’ll send you pre-production photos for your approval. The results are crisp, and make for easy reproduction as well. Art Submission— You’ll submit an order to us with your garments and art, and we’ll take care of the rest. Your art can be in almost any format; however, we prefer vectors. Because this process can be confusing, please let us know if you have any questions. If you want fast, reliable, custom embroidery services in the Seattle area, then The Foundry Print and Embroidery Shop is the place for you. No matter your needs, we can make your vision a reality with our personalized embroidery expertise in the Seattle area. Call us today, or send us an email for a quote. We look forward to working with you! *Please keep in mind that we require a 50 unit minimum on all contract orders.